CommentLuv is a commenting system that encourages visitor to comment, by displaying the visitor's latest post link in the comment- which is a good exposure for the visitor's website/blog- that's why people like to comment at the CommentLuv enabled website and blog, therefore brings more traffic for the site. Then how to install CommentLuv on Blogger (Blogspot.com)? 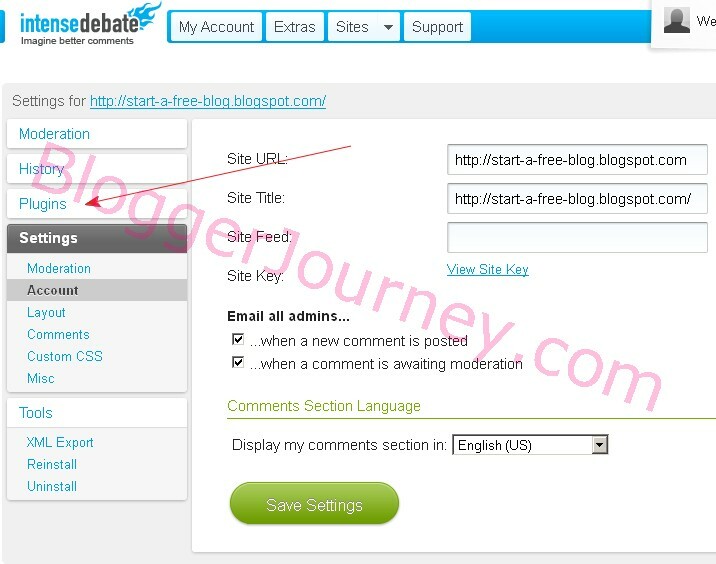 One of the largest online commenting system Intense Debate provides CommentLuv as a feature, so we can install Intense Debate on Blogger, then enable CommentLuv feature. 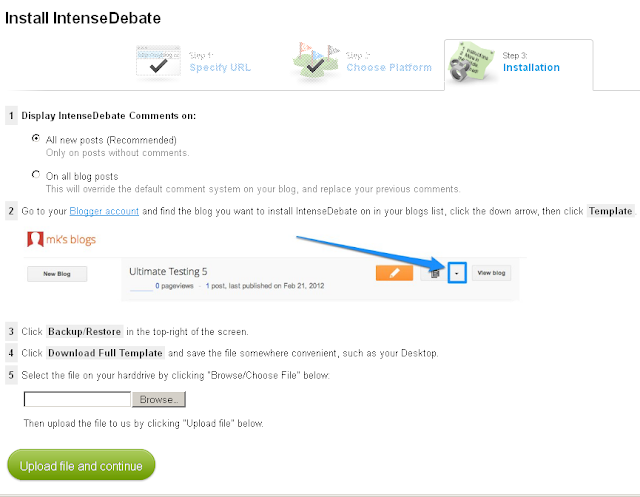 Therefore, Intense Debate asks you download your Blogger template to computer, then upload it to Intense Debate. Intense Debate instantly adds all its codes into the uploaded-template, and provides the updated template code back to you, in seconds. You can copy the updated codes, paste back to your blog template to overwrite the original codes. Once you save the template, Intense Debate will be showing under your posts ! Then, you can go into the Intense Debate account to enable CommentLuv. That's it. The logo of CommentLuv is a red heart, as showing at the left. Now let's install Intense Debate / CommentLuv on Blogger Step by Step. 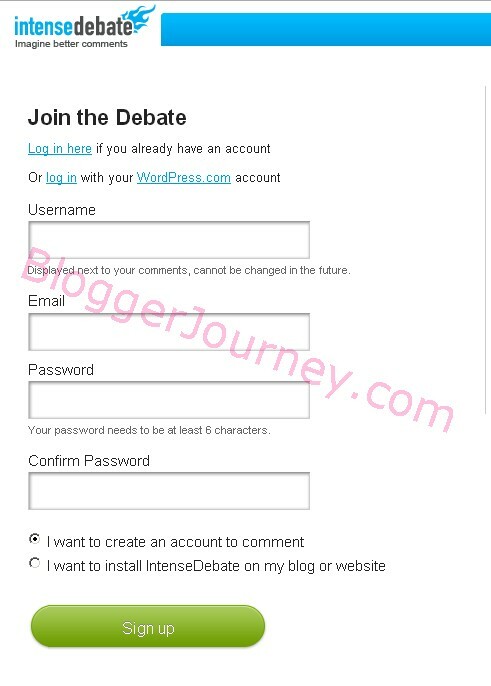 Create an account at Intense Debate is easy, it only asks for a Username, a password and a email address. - (important) select "I want to install IntenseDebate on my blog or website"
Then click on the green 'Sign up' button. D. You will see a new window with message asking you to check your email. Now open a new browser window, login to your email account, open the latest email received from Intense Debate, click on the verification page link inside the email. E. A new window now popup says "Verification Successful!" , as in following screenshot. 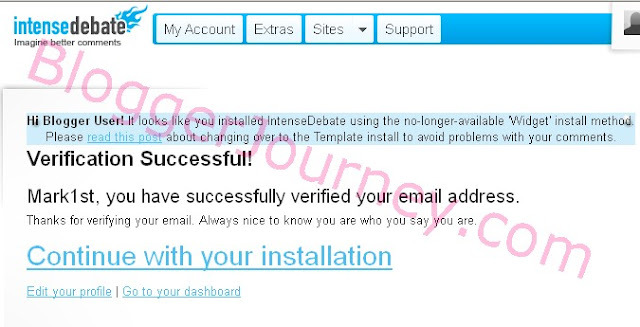 Click on the link at the page bottom says Continue with your installation. It will continue with the installation process. Now we come to the second stage.You will see following "Install IntenseDebate" page. 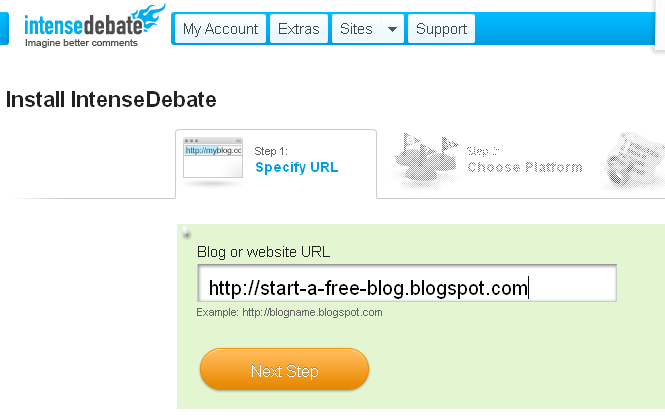 F. Type in your blog web address, and click on "next step" button. 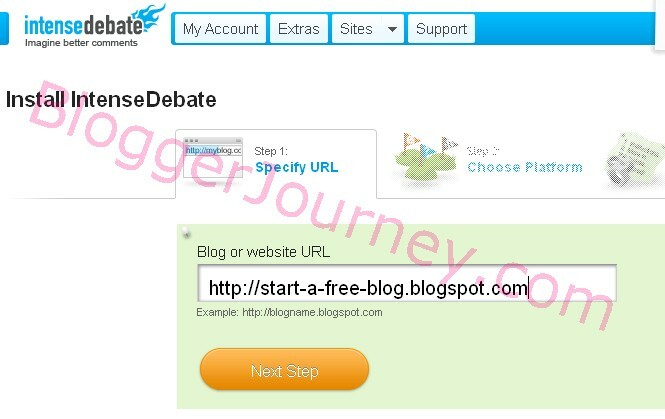 For example, the blog address I'm using is Http://start-a-free-blog.blogspot.com. If you are like me, using the default blogspot.com as blog address, Intense Debate knows it's on Blogger, it will bring you directly to next step;. H: You come to following screen, which have 5 steps to follow, please read carefully and do it one by one. Step 1: Choose any of the two options on the screen. 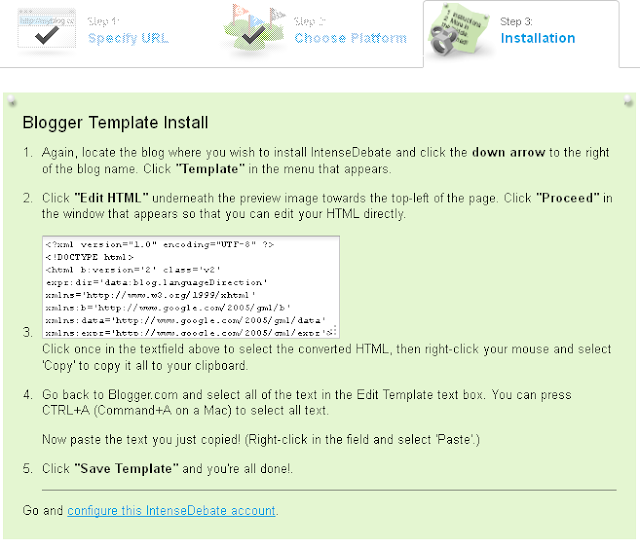 Step 4: In the pop-up window, click on Download Full Template to download your blog template to your computer, you can save it on computer Desktop. Make sure to remember the file name. Step 5: Switch the browser window back to Intense Debate, (at step #5 on the above screenshot) click on the 'Browse...' button (to upload the template file you just saved). In the pop-up window, browse to your computer Desktop, choose the file name you just saved, click on Open to add the template. You will see the template file name shows up in front of the "browse" button in above screenshot. Now, click on the green "upload file and continue" button (at the bottom of above screenshot) ! Your template has been uploaded to Intense Debate ! In following screenshot's step 3, it shows you the updated template codes for your blog- with Intense Debate codes added, and that's the codes you need to copy and paste into your template to overwrite the original codes. Step 1: Switch the browser window back to your Blogger. If you see any pop-up window in the front, close them. 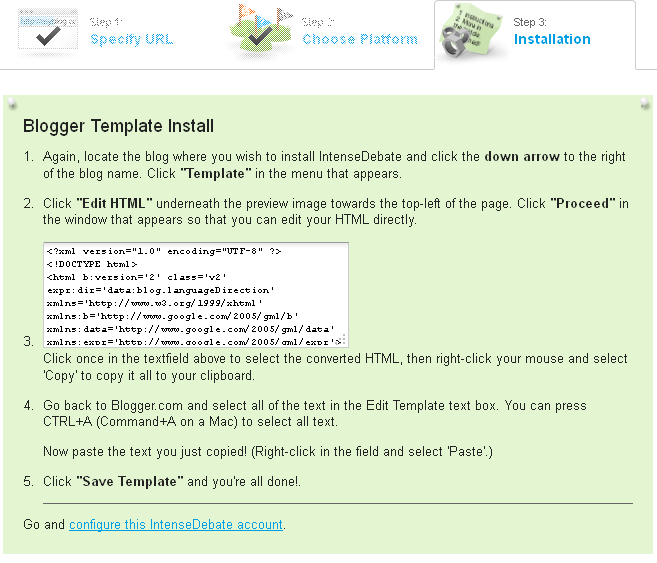 From blog dashboard go to Template option. Step 2: Click on "Edit HTML", then click on "proceed" in the pop-up window, you will see the blog template HTML codes showing in front of you. Step 3: Switch the browser window to Intense Debate, at step 3 in the screenshot, right-click on the HTML codes, and select 'copy' in the pop-up window. Setp 4: Switch the browser window back to your Blogger, on the template HTML window, press CTRL and A keys on the keyboard at same time, you will see all the template codes be highlighted. Now right-click on the high-lighted codes, select 'Paste' in the pop-up menu - your template codes now been replaced. Step 5: click on 'Save Template', you done ! J. Now, switch your browser window back to Intense Debate website, click on the link at the bottom of the page "configure this IntenseDebate account" (as in above screenshot). K. Click on Plugins at the left sidebar, the you will see a list of plugins, as in following screen. Scroll down, till you see CommnetLuv. L. Click on 'Activate' in front of the CommentLuv, You done ! Till now, you have enabled CommentLuv on your blogger blog ! Let's verify what has happened to your blog. Go to any of your blog post, take a look at the comments area under the post, do you see the lovely CommentLuv icon? 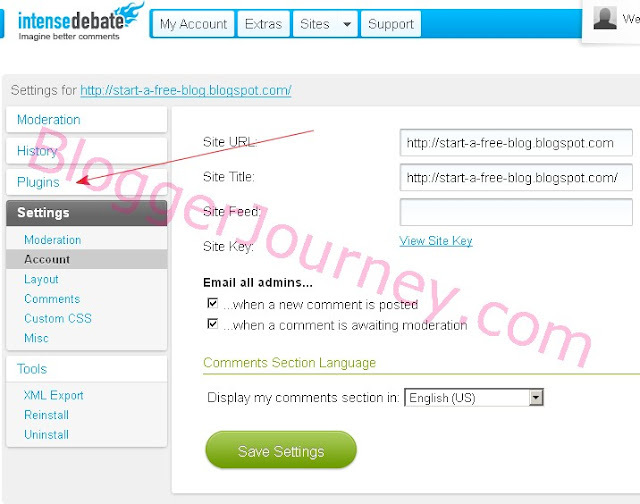 We can install CommentLuv on Blogger (blogspot) by installing Intense Debate at first, then enable the CommentLuv feature. How do you encourage people to leave comments on your blog? What's your experience with CommentLuv? Share your experience and insights in the comments box below. Thank you so much for this. I love what this widget provides to my website. Its now looking so complete after installing this. Thanks for providing this info. The widget really works well. 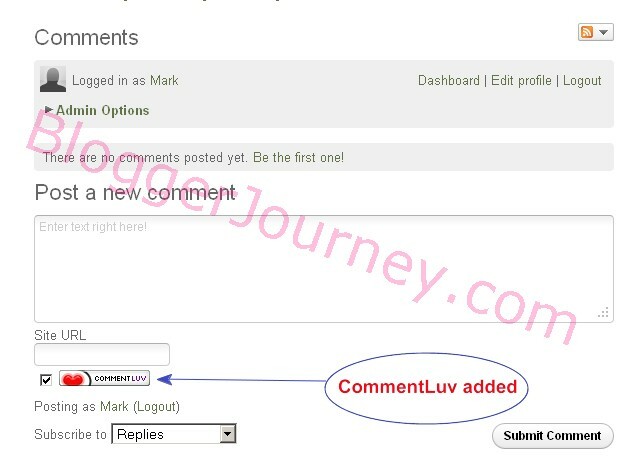 Good steps shown as it is necessary to install and enable comment luv plugins on you blog so that more users can share their views and for the bloggers also it is very much essential. this is an awesome post. I find it really interesting and helpful. Thank you for sharing this. this make my head became hot :( but great tutorials ! Very helpful, thank you! I have been wondering how to install CommentLuv. Again, you've been a great help to my blog by your tutorial. Thumb up! Hello there, I did try this one but it's not working for me. I did paste the IntenseDebate HTML and pasted it into the window that appeared after I hit "edit html." I then replaced the code there with the new code but it wouldn't save. Did I do anything wrong? Do you know how to change the commentluv box? Like put colors or put font size, color in it? Thanks in advance. I've used Intense Debate on my blogger for some time, and had NO idea I could add all these options! Thank you so much for this informative post! its showing me a message saying that my blog is already registered. now im stuck...pls help..
Intense debate is no doubt better than many others like disqus or livefyre. I've a problem: I installed both of them e they are ok but Blogger show that there aren't any comments while the post have already some comments. Can I do anything? Hi there. Commentluv is a great plugin but still I have not installed it in my website. I will install it ASAP. Thank you for sharing such a nice post. Hey I don't know How to create the Intense debate Account ..
Really nice content and thank you so much for share this content. I already know about intensedebate and intensedebate is a best way to get lot's of comments in your blog post.Anyway Thanks For sharing and i am visiting your site first time i really like your writing style keep posting like this and share more valueable blogging tips with us. nice sharing its very useful plugin..